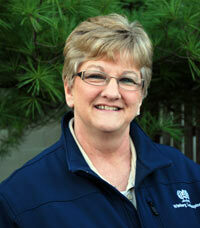 Connie has been part of our team since 1996. She started as a part time employee answering phones and typing estimates. In 1997 she accepted the Office Manager position. She manages our daily office operations, from customer service, accounts payable/receivables and even playing chef at our company lunches. It’s difficult to imagine that any day is typical at Wimberg Landscaping. You’re correct about that, and that’s one of the reasons why I enjoy what I do so much. My day starts early: sometimes before the sun is up to help get the crews out the door and to the clients’ homes. Purchase Orders are needed, special instructions, equipment, supplies: all are distributed as needed to start the new work day. Then it’s to the phones. I’m certain that one of the reasons we have so many long-term customers is that we talk to our clients in person or on the phone. We try to handle all the calls as they come in rather then direct them to a voicemail maze. In between phone calls I’m working on our billing, posting accounts payable, filing, handling special orders and special projects and on and on. We are very busy in the office but we still find time to drink a cup of coffee and share a funny story or two. While you don't spend a lot of time at the job sites, do you get a feel for the projects we install, including the plants? Most definitely. We see plans and pictures and hear conversations about the projects. When billing a project we see the plant list and I’m often enticed to research the plants online. I’m always learning about new plant material from the designs as well as popping out to the hoop house to see what’s being staged for installation. In the spring, the yard is full of plants, it’s just beautiful! Does this inspiration and interest in plants spill into your own landscape? In the twenty years of working with Wimberg Landscaping I've learned so much about plants, where and how to grow them, hardscapes, the different designs and different materials used as well as irrigation. Peter once invited an arborist to attend our weekly meeting and demonstrate the proper way to prune shrubs and trees. I was able to use that information in my own garden. I've had the opportunity of speaking to a designer on a daily basis, and had one of our designers redesign my front landscape beds. I also plant a vegetable garden. What do you enjoy most about working at Wimberg Landscaping? My co-workers are wonderful and our leadership team is great! I love the friendly and fun atmosphere. At our weekly company meeting Peter is always challenging us to go above and beyond with our work. Leadership tries to do things that are out of the ordinary, I believe, for a typical company such as company lunches, group outings to Reds games and acknowledging each employee's achievements. I am still surprised at how often we are the only landscaping firm to return a potential client’s call. Needless to say, they soon become our client. New clients share that our professionalism is above par, our service is very good and we simply have far more knowledge than other companies. Therefore, it’s not surprising to have customers that have retained our services for over 20 years. Speaking with them over the phone I feel like we are old friends, although we have never met face-to-face. Keeping a relationship with people we serve is what Wimberg is all about. I relax in the evenings by working in my garden or weeding my flower beds, volunteering at church and spending time with my husband, children and grandchildren.